Rising 6th Grade Families – WJCC Course Planning Night is Here! http://wjccschools.org/rb/wp-content/uploads/sites/12/2014/05/logo.png 0 0 Karen Swann http://wjccschools.org/rb/wp-content/uploads/sites/12/2014/05/logo.png Karen Swann2018-02-20 13:10:092018-02-20 13:10:09Rising 6th Grade Families - WJCC Course Planning Night is Here! Over the course of the school year, our school holds safety drills to help ensure that students and staff know what to do in the event of an emergency. These drills include, but are not limited to, fire, tornado, earthquake, and intruder/lockdown. Sometimes these drills will be planned and other times we will hold spontaneous drills to assess everyone’s ability to respond quickly to emergencies. On Friday, September 29th, we will hold an announced lockdown drill. Prior to the drill, staff will talk with students about the purpose of the drill and what will happen during the drill to prepare students for this very important safety exercise. There will be a practice lockdown drill later this week (September 14th). During the drill on the 29th, our emergency response partners from the James City County police will join us as we simulate how we would respond to an emergency situation requiring a lockdown. Together, along with division personnel, we will examine our procedures and responses during the drill. Also, during the month of September, we practice fire drills weekly; this then moves to once a month to be in compliance with state protocols for schools. Please note that if you arrive at our school during a drill, you will be asked to remain outside until the drill concludes. We appreciate your cooperation and apologize in advance for any inconvenience. We encourage families to discuss the importance of safety at school and in the community with their children. If you have any questions, please contact Ms. Swann or Mrs. Nelson at 757-229-7597. Laurel Lane Elementary is excited to introduce its new Little Free Library to our school community. A Little Free Library offers a great way to share books with our sudents year around. The addition of this Little Free Library to our community came about thanks to a collaboration between Mrs. Kristy Haight, Laurel Lane’s Media Specialist and The Junior Women’s Club of Williamsburg. This project began about a year ago with the Junior Women’s Club agreeing to sponsor and build a Little Free Library for our school. After construction was complete, 2 students volunteered to paint our library. The Little Free Library is located at the corner of the bus loop in front of Laurel Lane. The library is stocked with children’s chapter books and picture books. Please help yourself to a book and if possible leave a book for other children to read. Together we can keep our students reading year around! 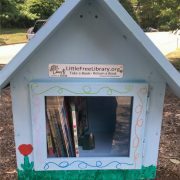 For more information about Little Free Library click below.